The Nevada County Fairgrounds Board of Directors announced that Patrick Eidman has been named the new Chief Executive Officer (CEO) of the Nevada County Fairgrounds, effective immediately. The Board of Directors of the Nevada County Fairgrounds announced this week that the search for the position of Chief Executive Officer (CEO) for the Nevada County Fairgrounds has begun. The CEO position is responsible for managing the Nevada County Fair, the Draft Horse Classic and Harvest Fair, the Country Christmas Faire, year-round events, concerts, the RV Park, and community gatherings at the Nevada County Fairgrounds. Qualified candidates should have a background in business administration, agriculture, and event/fair experience. Candidates should also have strong leadership, organizational, financial management, marketing and communication skills; as well as a willingness to be active in local, regional, and state association activities. The closing date for applications is October 15, 2018. GRASS VALLEY – The Nevada County Fairgrounds Board of Directors announced this week the appointment of Rea Callender as the new Chief Executive Officer (CEO) of the Nevada County Fairgrounds, effective June 8, 2015. The Board of Directors retained Ralph Andersen and Associates to conduct the extensive search, which produced interest from talented candidates from across the nation. An entrepreneur and philanthropist with corporate, start-up and non-profit experience, Callender, brings more than 25 years of sales and business development experience to the job; as well as accomplishments in fundraising, marketing, team building, and management. Callender has served as CEO and Founder of several businesses. He founded Schoolpop, Inc., an online loyalty marketing company and fundraising tool for K-12 schools, which raised $250 million since 1999 for K-12 schools nationwide. Additionally, he founded and built Animated Systems and Design, Inc., a website development company, which he sold to Bozell Advertising. Callender spent part of his youth in Nevada County, and his family owned a working 2,000 acre cattle ranch in Grass Valley. He participated in the Junior Livestock Auction at the Nevada County Fair in his youth, and his father ran the JLA for many years – and it was there that his love for the Nevada County Fair was born. He is a former Board Member of Child Family Health International; The Menlo Park Atherton Education Foundation; and The Parker School, where he implemented the “Leadership Speaker Series,” which brings business education to high school students via access to business leaders and real-life leadership experiences. He is a graduate of University of California, Irvine, where he received a Bachelor of Science degree in Economics. Rea Callender will begin as CEO at the Nevada County Fairgrounds on June 8. He replaces Sandy Woods, who became the CEO of the Fairgrounds in 2009, and has been at the Nevada County Fairgrounds since 1995. He will be responsible for overseeing the annual Nevada County Fair, the Draft Horse Classic, and the Country Christmas Faire; as well as the interim events and facility rentals, the RV Campground, and the infrastructure of the Nevada County Fairgrounds. Tags: Board of Directors, CEO, and Rea Callender. The Nevada County Fairgrounds Board of Directors announced this week the appointment of Rea Callender as the new Chief Executive Officer (CEO) of the Nevada County Fairgrounds, effective June 8, 2015. The Board of Directors retained Ralph Andersen and Associates to conduct the extensive search, which produced interest from talented candidates from across the nation. Tags: Board of Directors, CEO, Draft Horse Classic, Nevada County Fair, and Nevada County Fairgrounds. 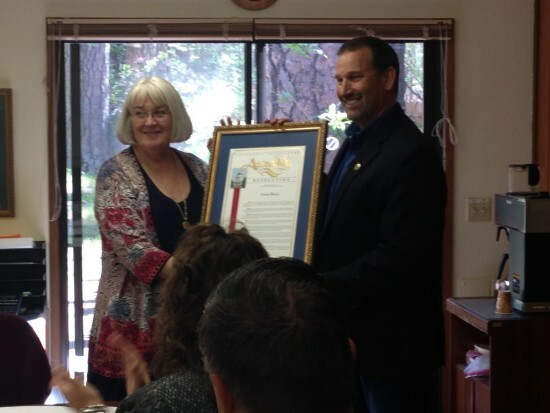 Assemblyman Brian Dahle presenting a resolution to Fairgrounds CEO Sandy Woods for all her work on behalf of the Nevada County Fairgrounds and the Fair industry. What a nice surprise! Tags: Assemblyman Brian Dahle, Brian Dahle, CEO, Nevada County Fairgrounds, Resolution, and Sandy Woods. For those interested, the application process and details can be found here. Electronic submittals are strongly preferred, and should be sent to Ralph Andersen & Associates via email at moc.n1555672652esred1555672652nahpl1555672652ar@yl1555672652ppa1555672652. The closing date for applications is March 30, 2015. If you have any questions or would like to discuss the opportunity further, please contact Norb Bartosik, Ralph Andersen and Associates, at (916) 630-4900. Confidential inquires welcomed. Tags: CEO, Chief Executive Officer, and recruitment. Tags: CEO, Chief Executive Officer, Grass Valley, Nevada City, Nevada County, Nevada County Fair, Nevada County Fairgrounds, Ralph Andersen and Associates, and recruitment. After serving for 20 years at the Nevada County Fairgrounds, Chief Executive Officer Sandy Woods announced this week that she will be retiring as CEO. Woods’ retirement will be effective upon the hiring of a new CEO. She will continue in her role as CEO until that time, and will assist the Fairgrounds’ Board of Directors in a transition plan for a new CEO. Woods has worked at the Nevada County Fairgrounds since 1995, where she started as Deputy Manager, and has served as the CEO since 2009. Additionally, Woods has served as a member of the Board of Directors of the Western Fairs Association since 2005, and served as the WFA Board President in 2012. She is the former Chair of the California Fairs Alliance, which provides advocacy and resource development for the network of California fairs. Woods was recently inducted into the Western Fairs Association’s Hall of Fame, and recognized for her dedication and significant contributions to the fair industry. An executive search for the new Chief Executive Officer will begin in February. Tags: CEO, Grass Valley, Nevada County Fair, Nevada County Fairgrounds, and retirement.